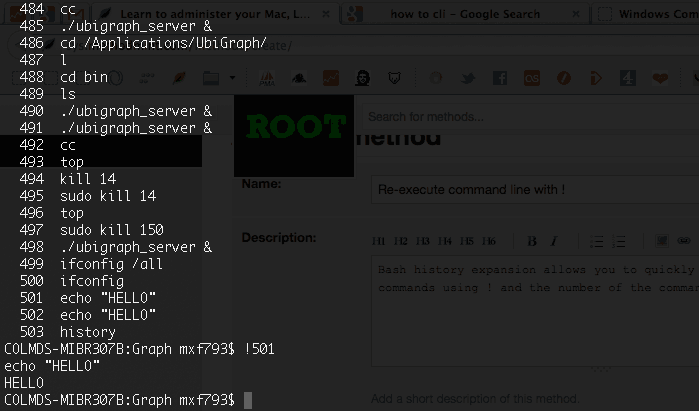 Re-execute command line with ! My PyQt GUI book Create Simple GUI Applications has been updated, with new chapters on multithreading and packaging your apps. Get it here. Bash history expansion allows you to quickly re-run previous commands using ! and the number of the command in your history. You can adjust the size of the history by setting the HISTSIZE variable in the shell e.g. export HISTSIZE=1000. You can clear the current history with history -c.
Notice that each entry has an associated number which can be used to refer to the command. This method is based, with permission, on an original protocol available here.